Small photograph dated March 1896 of a woman identified on the reverse as Abbie Amanda (Crouse) Gerring Steward. 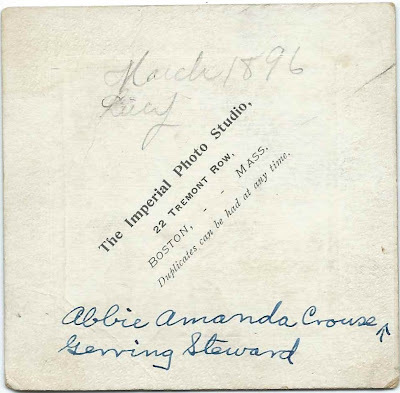 The photograph was taken at the Imperial Photo Studio at 22 Tremont Street, Boston, Massachusetts. Abbie Amanda Crouse was born about 1842 in Nova Scotia , the daughter of Jacob Crouse and Abbie (Bangs) Crouse. Abbie (Bangs) Crouse was born at Plymouth, Massachusetts; I'm not sure where Jacob was born, but possibly at Crousetown, Nova Scotia. Perhaps Abbie Amanda Crouse was also born at Crousetown or near there. On April 2, 1862 at Boxford, Massachusetts, Abbie married fisherman George Gerring III, son of George Gerring and Elizabeth H. (Marston) Gerring. 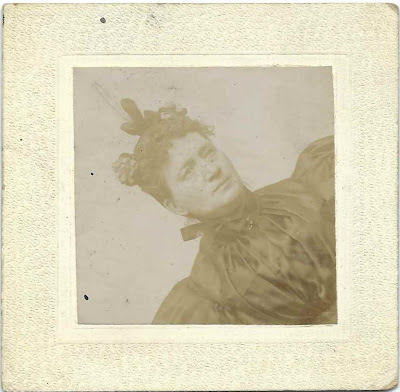 Abbie and George III had, I think, two children, one of whom was Martha Parsons Gerring, who married John Sanford Ballou - the 1901 photograph of their daughter Maude Gerring Ballou is featured in another post. I'm not sure if George III died - fishing was and is a dangerous profession - or they divorced, but Abbie married Joseph McLellan Steward at Boston, Massachusetts, on December 25, 1867. Joseph was born August 11, 1842 at Boston, Massachusetts, the son of Charles Steward and Lucy (Albee) Steward, who were born in Nova Scotia and at Edgecomb, Maine, respectively. Joseph was also involved in the fishing industry, but ashore. Abbie and Joseph had, I believe, six children. Abbie Amanda (Crouse) Gerring Steward died December 27, 1906 at Winthrop, Massachusetts; Joseph died in 1920. They're buried in the Winthrop Cemetery at Winthrop, Massachusetts.